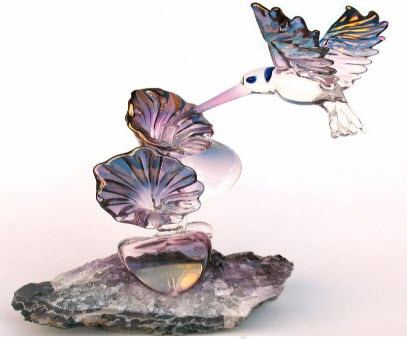 A hummingbird sculpture is a beautiful way to capture the essence of their spirit and be reminded of them all year long. Whether you offer one as a present to someone who is passionate about the delicate little birds, or you purchase one for yourself, you’ll be pleased with decorative accents they offer your home. Here are our top picks for hummingbird sculptures. This finely hand blow sculpture would make an exquisite gift for any special day. It is artistically designed from borosilicate crystal. The 24k gold elements highlight the angelic wings of the hummingbird and the stunning petals of the flowers. The gorgeous colors of the sculpture will capture the attention of everyone in the room. 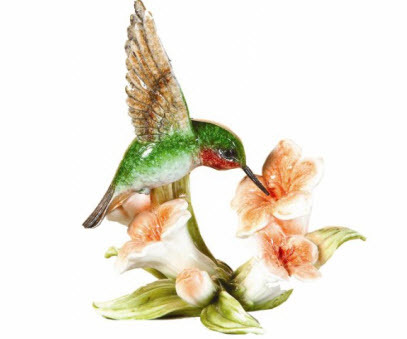 The striking design of this Stonecast hummingbird sculpture encapsulates the natural setting of the hummingbird. The ruby throated hummer that is featured feeding from coral-colored flowers is resting on a base of greenery and will look amazing in your home. The green back of the bird is eye-catching and extraordinary. The sculpture makes a welcomed gift for mothers, grandmothers, sisters and friends. 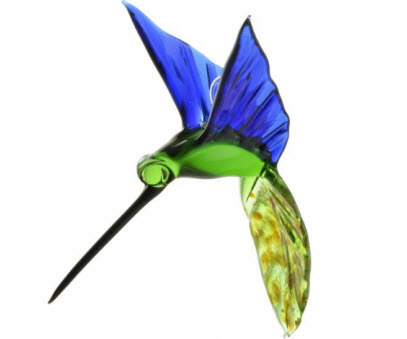 The dazzling design of this handcrafted sculpture makes the perfect gift for your favorite hummingbird admirer. This piece can be placed in any room in the home. The translucent wings and body demand the attention that a live hummingbird fluttering by would. When the sunlight hits the glass, you’ll be amazed at the oceanic colors that are displayed. If you want to make a statement, this meticulously designed sculpture offers the finest attention to detail that will leave you enthralled. 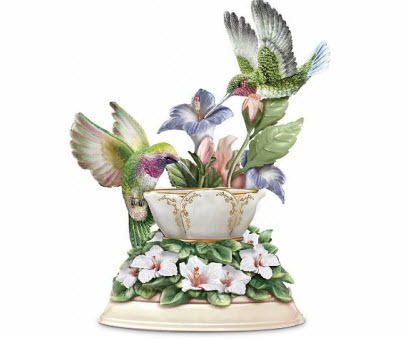 The oil cup allows for the secret garden to come to life with the realism of the floral aromas. The delicate flowers will leave you breathless and the two hummingbirds offer you a true glimmer into their magical world. 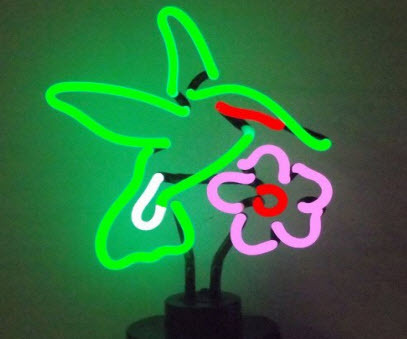 If you want to offer the hummingbird fanatic in your life something a little different, this neon hummingbird sculpture is just the piece. Teenagers and adults love the hand blow tubing and you don’t have to worry about any wiring. Just plug it in and enjoy! 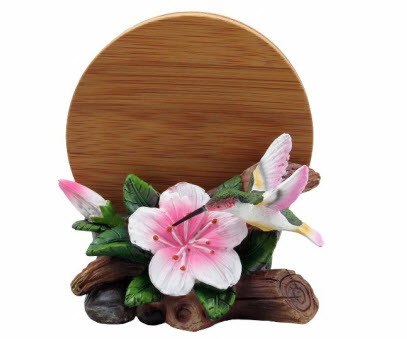 With a spring-like feel to this sculpture that holds quality crafted bamboo coasters, you’ll forget how practical it is. The pink accents are a beautiful touch and the hues of green will charm hummingbird and art enthusiasts alike. This lamp has been turned into a sculpture that represents the hummingbird’s oasis brilliantly. 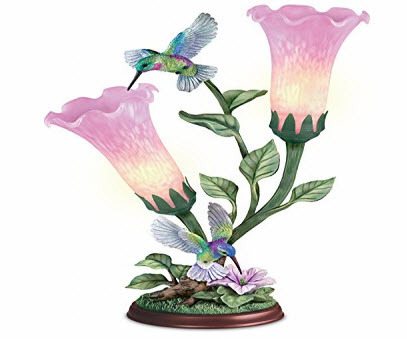 Enjoy the hummers as they feed from the smartly crafted flower at the base and the delicate glass flower shade at the top. This will please the eyes whether it is turned on or off.